As Android manufacturers started updating Android 9.0 Pie to there smartphones, HTC has today confirmed through its official twitter account that four of its smartphone will receive this latest update. The manufacturer has been guaranteeing the Android Pie for the smartphones like HTC U12+, U11+, U11, U11 life (Android One) and its roll out will be announced later. Recently, HTC U12+ has received a major update that fixed issues with its pressure-sensitive buttons, added auto zoom in the camera app, and updated more improvements. 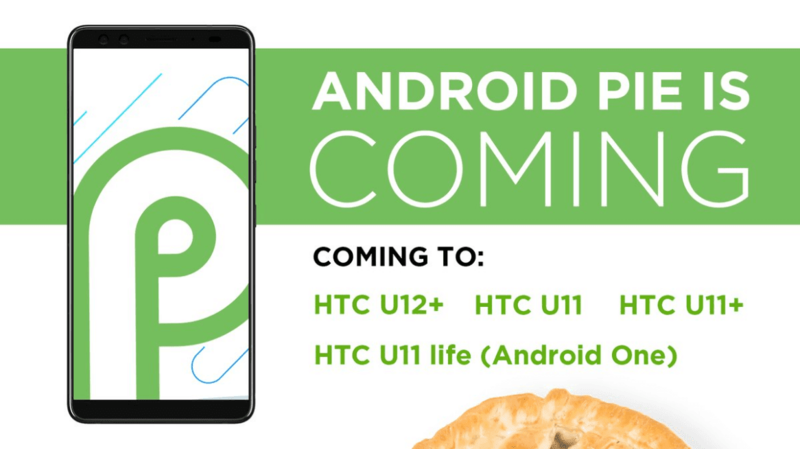 It should be noted that HTC has promised the Android Pie update for the Android One variant of the HTC U11 Life (that was sold in international markets), but not for the HTC Sense-powered U11 Life (that was sold in the US). So it is speculated that the Sense-powered U11 Life released with Android Nougat will probably not receive the Android Pie update. When it comes with Android OS updates, most manufacturers had a bad track record and HTC is no exception, however the new information on the aforementioned handsets gives its users a hope. It seems HTC typically rolls out major Android version updates only to its flagship smartphones and they too have an update life-cycle of two years, which could be the reason why HTC 10 will not receive the Android Pie update. It should be noted that the HTC U Ultra launched in 2017 with Android 7.0 Nougat and Qualcomm Snapdragon 821 SoC is also missing in the list of HTC smartphones.